The NHS was born was 5 July 1948. 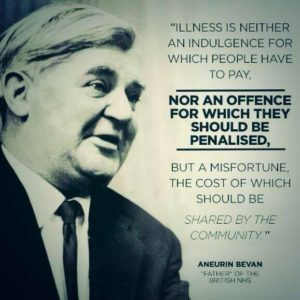 Aneurin Bevan, a Welsh Labour Party politician who was the Minister for Health following the Second World War, launched the NHS in the Park hospital in Manchester, otherwise known today as Trafford General Hospital. Since its opening it has continued to evolve, develop and improve and remains as one of the most envied health services in the world. Born from the desire to ensure good healthcare was available to all, the NHS began by taking control of 480,000 hospital beds in England and Wales, with an estimated 125,000 nurses and 5,000 consultants available to care for hospital patients. The NHS was born was 5 July 1948. Aneurin Bevan, a Welsh Labour Party politician who was the Minister for Health following the Second World War, launched the NHS in the Park hospital in Manchester, otherwise known today as Trafford General Hospital. Since its opening it has continued to evolve, develop and improve and remains as one of the most envied health services in the world. Born from the desire to ensure good healthcare was available to all, the NHS began by taking control of 480,000 hospital beds in England and Wales, with an estimated 125,000 nurses and 5,000 consultants available to care for hospital patients. 1. Increases in life expectancy – Since 1981, life expectancy for men in England has increased from 70.9 years to 79.4 years and life expectancy for women has increased from 76.9 years to 83.3 years. 2. Reported use of drugs and alcohol – In 11-15 year-olds, this has roughly halved between 2003 and 2013. 3. Reduction in numbers of people smoking – The ban on smoking in public places is estimated to save the NHS over £380 million a year (smoking and cancer link 1954, smoking ban 2007). 4. Safe food – Setting temperature standards for keeping food safe in supermarkets and food outlets. 5. Reduced salt targets in food – In bread, cakes, biscuits, breakfast cereals, snacks, pastries, pasta, rice among others. 6. Fewer infectious diseases – Typhoid, cholera and tuberculosis (TB) (1958 polio and diphtheria vaccinations programme). 7. Increased access to family planning services – Reducing unwanted pregnancies and transmission of sexually transmitted diseases (1967 abortion act, the introduction of the contraceptive pill, 1986 first AIDs campaign).